The tree was a sapling when men came to Tamriel from Atmora in the Late Merethic Era. It is said to be older than metal, which makes it impervious to regular weapons; to harm the tree, one must use Old Magic. It is located in a cave known as the Eldergleam Sanctuary, where many worshippers of Kynareth go as a pilgrimage. Like many places of natural beauty, the sanctuary is protected by Spriggans. The sap of the Eldergleam is precious, as it can restore barren fields or bring life to rocks. 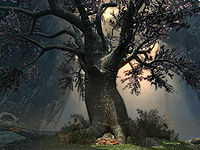 The tree is thought to be sentient, or at least responds to worship, but it bears no apparent relation with the Hist of Black Marsh. The Gildergreen, an iconic tree in Whiterun, was grown from a cutting or seedling (accounts vary) taken from the Eldergleam during the early days of the settlement. Its presence in Whiterun also attracted pilgrims and turned the settlement into a center for worship of Kynareth. Amber produced by the Eldergleam is known to sing a faint and soothing melody. In 4E 201, the Gildergreen was struck by lightning, much to the despair of many pilgrims. The local priestess of Kynareth, Danica Pure-Spring, requested the aid of the Last Dragonborn in restoring the tree. Danica had the Dragonborn acquire Nettlebane, a weapon made by a coven of Hagravens which had the power to damage the natural world. With the weapon, the Dragonborn was ordered to strike the Eldergleam and recover its sap, which could be used to restore the Gildergreen. Maurice Jondrelle, a pilgrim who accompanied the Dragonborn to the Eldergleam Sanctuary, was appalled by the plan and instead offered to pray to the tree and request a new sapling, which could replace the damaged Gildergreen. It is unknown whether the Dragonborn extracted the sap or took the sapling, but the Gildergreen was restored, much to the appreciation of the people of Whiterun. For game-specific information, see the Skyrim Eldergleam Sanctuary article.